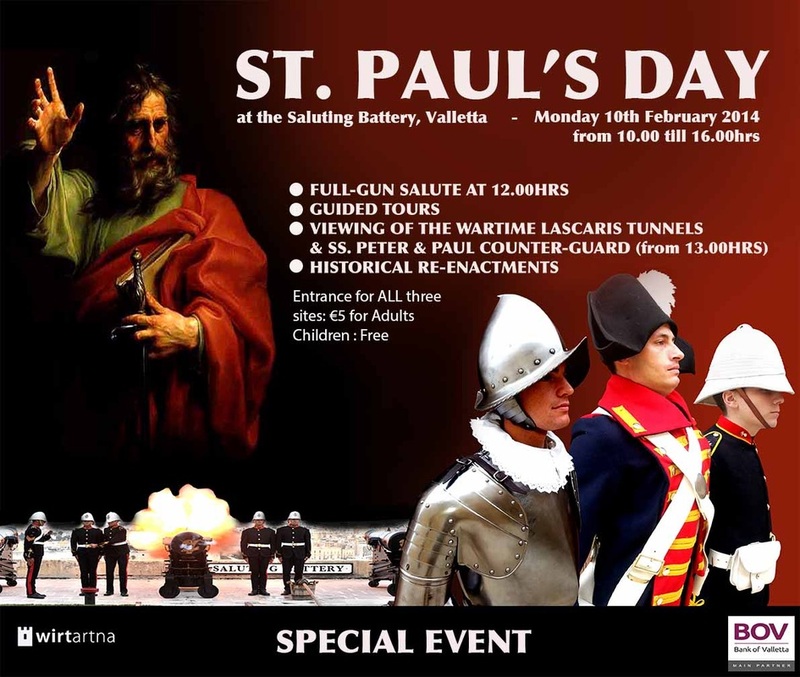 On the occasion of St. Paul's Day national holiday, Fondazzjoni Wirt Artna is holding a special event at the Saluting Battery, Valletta with special guided tours of the newly restored heritage site and a full-gun salute at 12.00hrs. As part of the same, FWA shall be offering a one-time opportunity to view the WW2 Lascaris Tunnels in Battery Street and the Saint Peter & Paul Counter-guard located on the other side of the Valletta main ditch. Programme: 10.00 to 12.30hrs: Guided tours and full-gun salute at the Saluting Battery. 13.00 - 16.00hrs: Guided tours of the Lascaris Tunnels and Counter-guard. At the end of each tour there will be a historical re-enactment representing different periods of history: Renaissance, Napoleonic & Victorian. Entrance fee: €5 per Adult. Free for all FWA members, BOV members of staff on showing their employment card and children u/16yrs (accompanied by an adult). 10.00 to 12.30hrs: Guided tours and full-gun salute at the Saluting Battery. 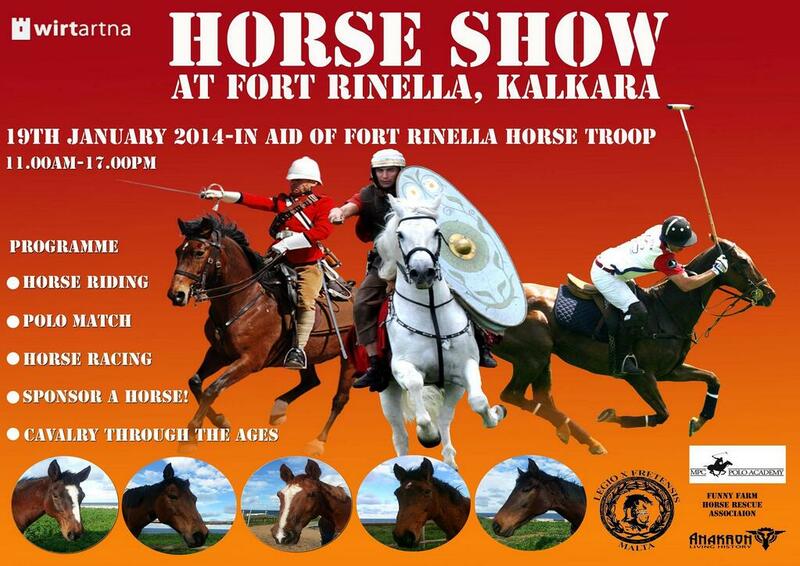 A Horse Show is being held at Fort Rinella on Sunday 19th January 2014 to raise funds for the resident Horse Troop which provides the daily horse re-enactment displays there. On this occasion, the public will get to see the horses used in our daily re-enactment displays and will be offered to sponsor a horse in part or in full. The show will consist of a number of horse related activities varying from sports, historical re-enactments to horse rides for individuals and children. The show will start at 11.00am and will go on till 17.00hrs. The main show depicting the use of the horse through the ages will start at 15.00hrs. Throughout the event, Fort Rinella will be open to the public for regular visiting. also for this day the entrance fee for both the fort and show will be reduced by 50% to €5 for adults and €2 for children under 16 years of age. FWA members will enter for free. For inquiries please call on 21800992 - 21803091 during week days and normal office hours. 11.00 - 12.30: Pony Rides -Visits to fort - film shows. 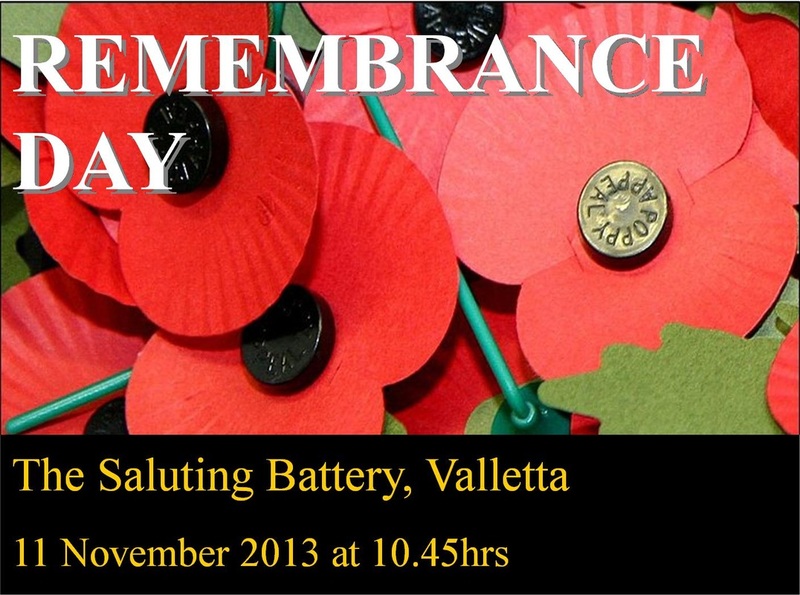 FWA will commemorate Armistice Day at the Saluting Battery, Valletta on Monday 11 November 2013 starting at 10.50hrs. This year a naval contingent from the Royal Navy frigate HMS Dragon will be participating. The service of remembrance will be co-celebrated by Canon Simon Godfrey, Chancellor of the St. Paul’s Anglican Cathedral, HMS Dragon’s chaplain Rev. James Francis, and Rev. Camilleri, the new Parish Priest at Portosalvo Church, Valletta. Detachments from various veterans associations will also be in attendance.